IN A LARGE BOWL, PLACE THE FLOUR, SUGAR AND BAKING POWDER. MIX. USING YOUR HANDS, MAKE A BALL AND COVER WITH PLASTIC WRAP. PLACE IN THE REFRIGERATOR. TAKE THE DOUGH OUT OR THE REFRIGERATOR AND, USING YOUR HANDS, TAKE ABOUT 1/2 TBLSPOON OF DOUGH AND SHAPE IT IN ROLLS. 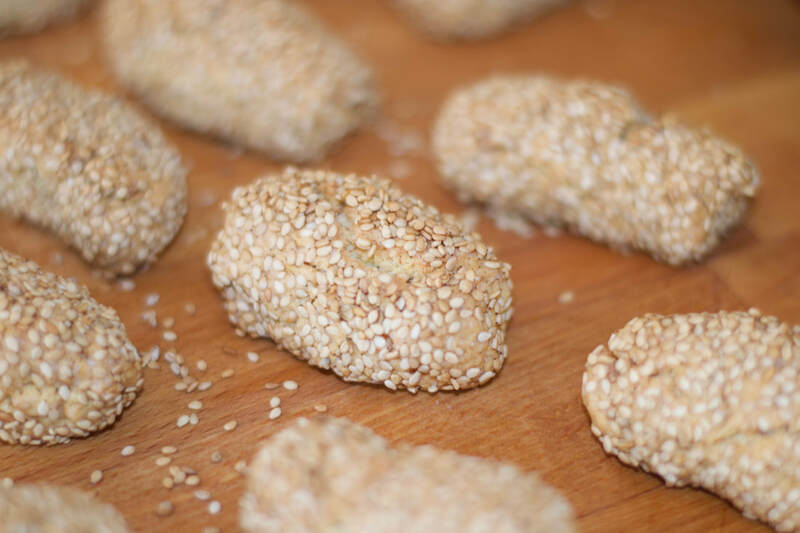 ROLL THE COOKIES IN THE SESAME SEEDS AND PLACE THEM ON A COOKIE SHEET COVERED WITH PARCHMENT PAPER. PLACE THE IN THE PREHEATED OVER FOR 10-15 MINUTES. TURN THE HEAT DOWN TO 300°F AND COOK 10 TO 15 MORE MINUTES. TAKE THE COOKIES OUT OF THE OVEN AND OFF THE COOKIE SHEET. COOL AND ENJOY PLAIN OR DUNKED IN A SWEET WINE OR COFFEE! !